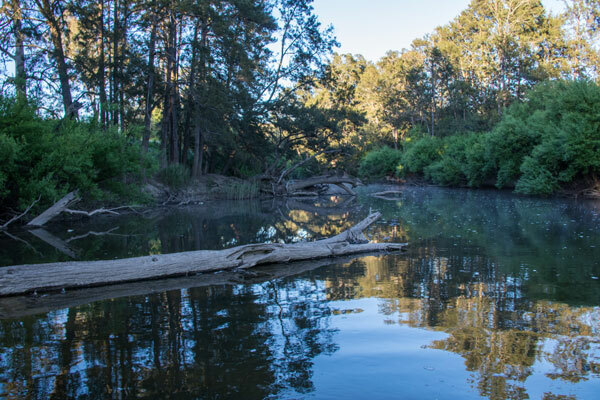 Peering down into the crystal clear waters of the Upper Murray I spotted a monstrous set of logs that was most likely home to a decent fish. The top of the log was an easy two metres below the surface with the bulk of the structure sitting on the bottom in four metres. My lure choice to start the trip was the trusty spinnerbait, which I cast over the top of the submerged structure. I cast beyond the logs as I knew my lure needed the distance for it to flutter down and reach the depth. I watched it flash as it fell through the crystal clear water and it only just scratched the top of the log while never leaving my line of sight. The spinnerbait didn’t sink quick enough in the clear water and I started pondering an alternative lure. 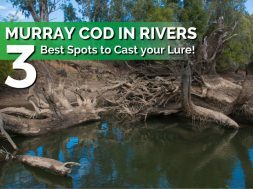 The Upper Murray is a brilliant fishery with not only Trout but both Murray cod and Golden perch in healthy numbers. The cod in this waterway are fit, thick and strong but my favourite part of all is the clear water, backed by some of the best scenery in the country. It was late March which was heading towards the end of the peak season (summer) but the water was still low and clear, but just a tad on the cool side. The morning session was slow with only a few small fish on the board. Mid-morning without a fish meant a lure change was needed. I took off the favourite lure and tied on a Berkley Powerbait Rib Shad rigged weedless. 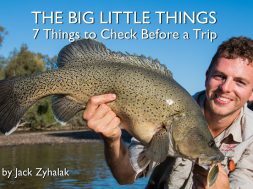 We’ve had success on these in the Murrumbidgee River previously but I could honestly say I wasn’t overly confident on this occasion. After a few casts my confidence grew as this lure looked incredible on the retrieve and it was possible to let them sink down deep and into the structure. I floated down a shallow section of river and spotted an ancient and weathered red gum laying in no more than a metre of water. With the exceptional clarity I could well and truly see the surrounding stone bars. The feature that caught my attention was the large crack that opened up along the entire length of the log. Maybe it was big enough to hold a fish? My first cast landed on top of the snag and the current pushed it away before it was able to sink close. I allowed it to swing around and started to retrieve while preparing my next cast. The lure was about 3 feet from the boat before I spotted a cod come flying out from the crack in the log at lightning speed, it travelled more than 4m in seconds to inhale the plastic right at my feet! 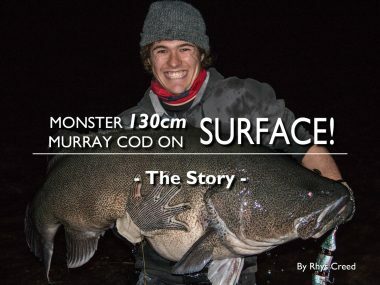 To this day it’s the most visual and aggressive attack I’ve ever seen from a Murray Cod! The distance that this fish travelled was insane and I put it down to the life like action of the plastic. It looked just like a baitfish and this chunky cod wanted it! In clear water you cannot go past a soft plastic. As there are more anglers casting lures on a regular basis the natives are accumulating their intelligence levels. Many juvenile cod are caught because they cannot tell the difference between real food and imitations. It doesn’t take them long to associate the thump of a spinnerbait blade or the pulse of a hard body with the danger of being captured. Ultimately this means we catch less fish, unless we adapt our lures and presentations. 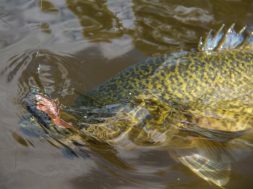 Those larger and smarter fish are still out their gorging on anything they possibly can; baitfish, carp, yabbys, crays, small mammals and birds. The reason we cannot catch them isn’t because they don’t eat, it’s because they are smart. 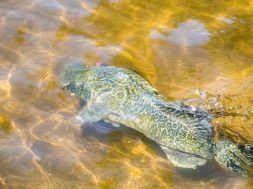 They can sense what is real, so we need to match these common preys as best we can and one way to do this is by using soft plastics! 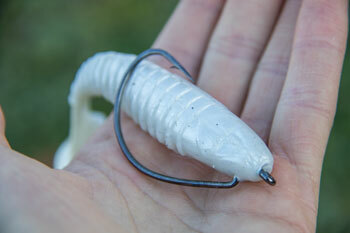 Soft plastics are the simplest answer to matching the hatch. They represent baitfish perfectly as they can be moulded into any shape or form, in any colour and pattern. They also feel similar to a real baitfish with that squishy texture, an area where a hard body lure or spinnerbait fail. 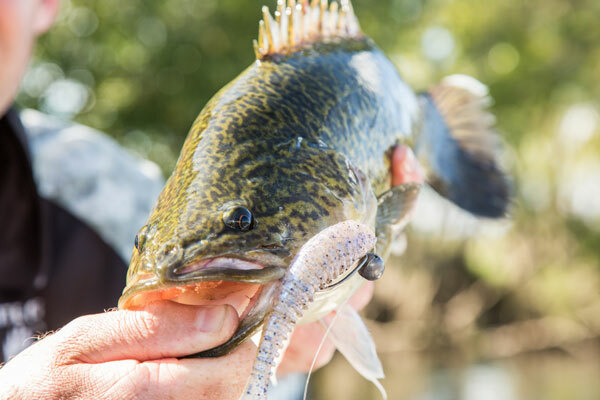 The lifelike look and action triggers the fish to attack, and that softer feel prompts the fish to bite down harder and hold on for that extra split second. This is important for your hook up rate (which I’ll explain later). 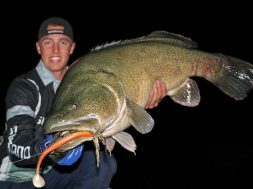 You may be thinking to yourself that soft plastics have been around for over a decade now and are one of the best Flathead and Trout lures around, why have they only just become good for Murray cod? It all comes down to snag resistance! 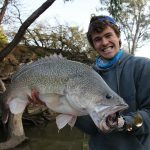 Murray cod live in dense structure and a soft plastic rigged on a standard jig head, is not snag resistant. This makes it almost impossible to fish them and that’s why spinnerbaits and hardbody’s are the go to cod lures and have been for the past few decades. But that’s where the weedless rigging style comes in and allows us to fish soft plastics tight in against the timber without snagging. You can’t go out and use any plastic you like, it just won’t work! Not only do you have to find the correct size plastic with the right shape and colour, but it needs specific features to help make it snag proof. This is the biggest key to a successful weedless soft plastic. You cannot have a bulky body because you need the space beneath the plastic so that when the fish bites down the plastic will push down exposing the hook. It’s all about getting a positive hook up. If you were to have a deep plastic, the gap between the belly of the plastic and the weedless hook wouldn’t be enough and therefore more chances of missed hits. We know plastics work, we just need to get them into the structure without snagging and when the cod attacks it needs to hook-up. These are the two most important factors of a weedless soft plastic. A soft material is important as this will help the plastic to be pushed downwards, again exposing that weedless hook. If a plastic is tough and robust it won’t collapse on those softer and more timid hits. The downfall of the softer material is you will go through large numbers of plastics due to tearing and ripping, but it’s worth it. Once you have the two important factors sorted you can look at your shape, style and colour. I like paddle tail plastics over the curl tails. The paddle tail more closely represents a swimming fish and therefore is more successful, especially in clearer water where the fish feed via sight rather than vibration. 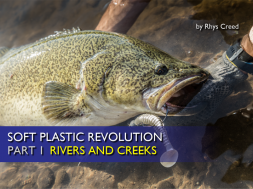 There is no one best size for the plastics, it all depends on the fish you are targeting. 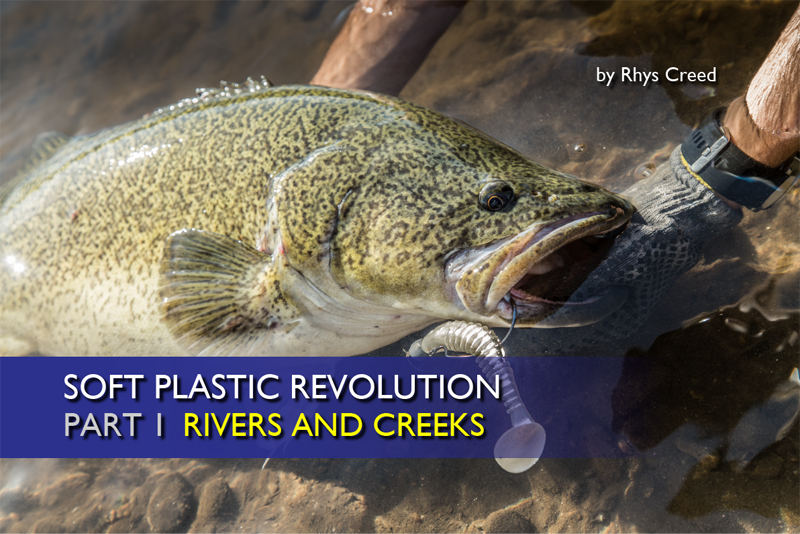 If you are targeting smaller fish in a creek an 80-120m plastic is perfect. These same plastics work well in the larger rivers but if your chasing monster fish you can use plastics up in around 200mm. I prefer 80-140mm in length as they are still small enough for the juvenile cod to take but will still pick the attention of larger fish. A range of different colours is always a good idea, both bright and naturals. Bright greens, silvers, and whites are my preferred bright colours and natural redfin patterns, dark greens, blacks and reds are the pick on the other end of the scale. 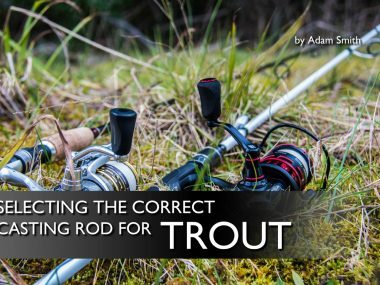 Getting this right is vital in ensuring your lure doesn’t snag! It’s relatively straight forward but will vary slightly with different plastics and different hooks. Make sure you purchase extremely good quality weedless hooks. This style of fishing is all about making sure you connect with the fish, razor sharp weedless hooks are paramount. I use the Owner Weedless Worm hooks which have a sharp cutting point and a large, deep bend in the shank. 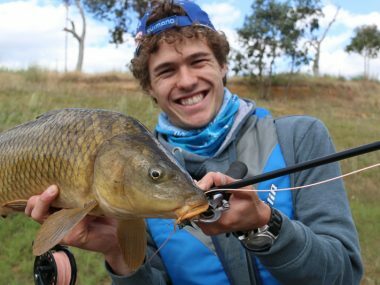 You want to use a hook with a deep bend as it gives you more space under the belly of the plastic which means more room for the plastic to move when the fish attacks. The hook size can vary depending on your plastic and ensuring you match them correctly is important. I always have 5/0, 6/0, 7/0 and 8/0 on hand with 6/0 and 7/0 being the go to size. 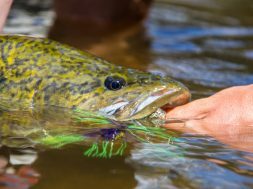 Matching the hook to your chosen plastic is simple; you want to set the hook back as far as possible without impeding on the tail action of the plastic. Most plastics have a section towards the tail where the plastic narrows, you want to make sure you don’t go past this section. If you struggle to find this spot, the standard rule is to set the hook 2/3rds of the way along the plastic. We use the Berkley Powerbait Rib shads which are 114mm in length and they match perfectly to a 6/0 or 7/0 hook. Step 1 – To rig the plastic you simply pin the hook in through the nose of the plastic and then run it straight out of its chin (the same distance in as the small 90 degree bend at the front of the hook). 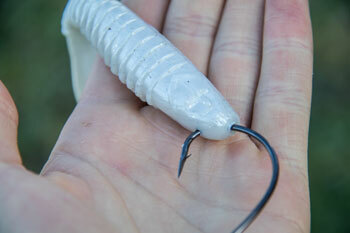 Step 2 – Push the nose of the plastic right up onto the eye of the hook and it should sit in snug. From here you want to measure where the plastic sits against the hook by laying it on the side (like measuring a normal plastic with a jig head). Step 3 – Then push the hook up through the belly and out at the top. You’ll notice the hook will come out of the plastic and the point will sit flush and snug along the back of the plastic. Make sure the hook point stays as close as possible to the plastic and this will help with snag resistance. Sometimes when a weedless plastic isn’t rigged correctly is can snag up and become annoying. One way to avoid this is by hiding the point of the hook under the back of the plastic. This will make the plastic more snag resistant but make sure you only just cover the hook point to ensure positive hook-ups. The next step is choosing your weight and my preferred way to attach weight is by running a ball sinker inside the loop knot. The best part about it is you can change the weight just by tying a new knot and you don’t have to re-rig the plastic. Start your loop knot with the overhand loop. Once this is done, slide on your ball sinker and run the tag end of the leader up through the bottom of the eyelet on the hook. Finish the knot like normal, this means the sinker is in the bottom of the loop and will ensure that your plastic swims upright. My two preferred weight sizes are 2 and 3 with 4 coming in handy in fast and deep water. 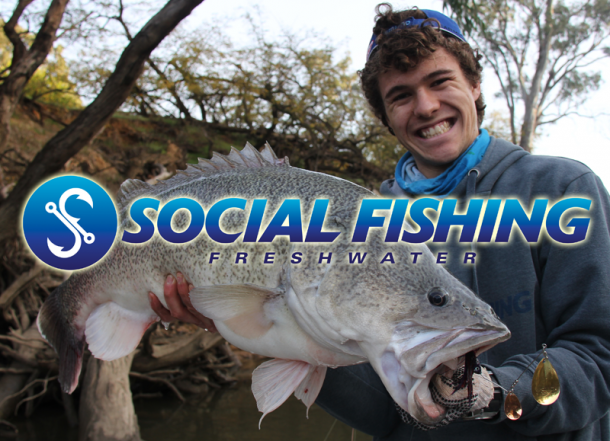 Size 2 is perfect for shallow water and allows the plastic to sink slowly and 3 is a great all round size. 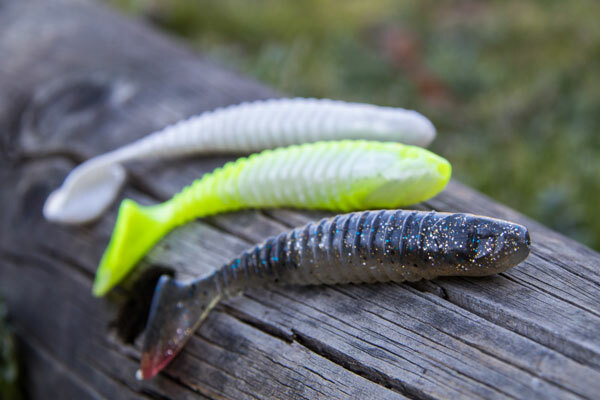 Weedless plastics work just as well on the same structure that you would confidently cast a spinnerbait at, as long as the plastic is rigged correctly. It can bounce through heavy timber, willows and rocks without any trouble at all. When you begin fishing with plastics you will notice they are much different to cast and fish. They are very quick and aerodynamic off the rod tip which means they cast like a bullet and less energy is required. This takes time getting used to so be careful when you first start casting plastics (you may end up with lures in trees and on the bank). 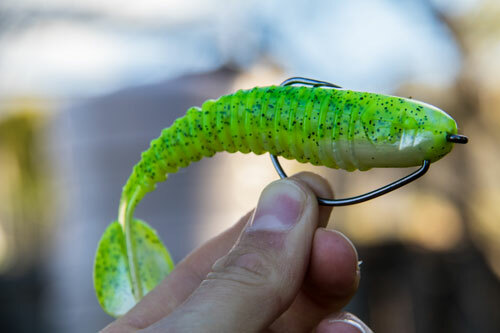 They are the perfect lure choice when there is quick current flow as they cut down through the water rather than being pushed like a spinnerbait. This means you won’t have to cast as far up stream of the structure and you can direct your casts much tighter to the timber. 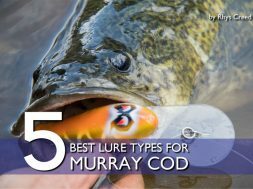 Always engage your reel as quick as possible because plenty of cod will sit very high in the water column and these lures will cut through the water quick, as soon as they break the surface. You don’t want a cod to hit while you still have slack line. Soft plastics have almost zero resistance running through the water column, unlike a spinnerbait or hard body. On the retrieve it will feel like you are winding nothing at all which can take some getting used to but it does provide you with a greater sense of feel beneath the water. It’s much easier to tell when you have tapped the side of a log and this can help with avoiding snags. As soon as you feel the plastic bump the log you can give it a sort sharp lift and it will bounce over the structure. 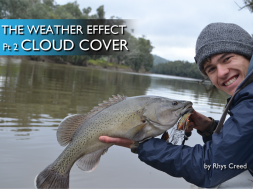 Even better, the hit from a Murray cod feels more intense and powerful when using a soft plastic! When it comes to retrieves, a slow and steady roll is always best. If you have a plastic with a large tail it will emit a deadly side to side wobble on even the slowest of retrieves. It doesn’t hurt to add in the occasional pause and twitch as this can sometimes switch on a following or intrigued fish. If you find that you are having to increase the speed of your retrieve to keep the lure from bashing the snags or off the bottom then your weight is too heavy. Drop a sinker size and you will be able to fish the section of water more effectively. Sometimes you will find that the plastic is getting wedged against timber with the ball sinker. This will happen if you let the plastic free fall, to stop this happening you should always have contact with your plastic and allow it to swing down, rather than free fall. This will help you feel and avoid the structure. Tip: Do Plastics work in Dirty Water? As you will have figured by now, plastics work better in clearer water. This is true but it doesn’t mean you should write them off in coloured water. 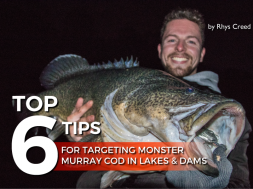 Anglers believe that Murray Cod lures need produce a massive thump, vibration and pulse. 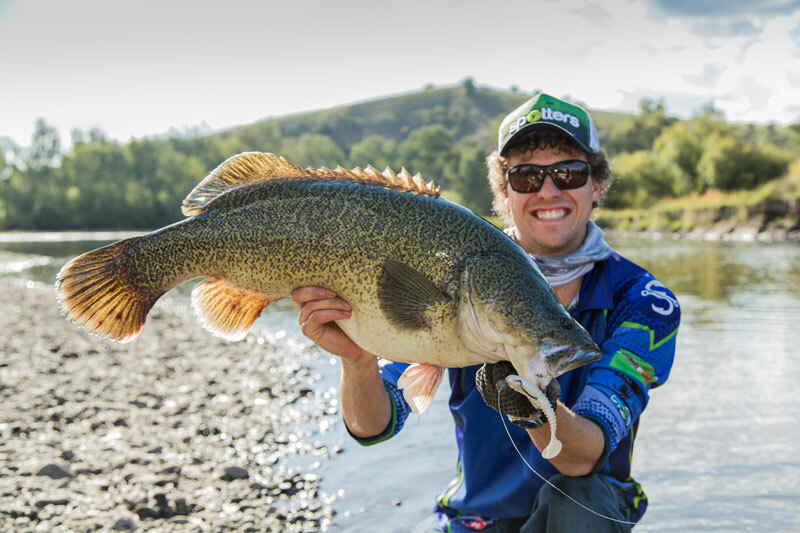 This is why you see spinnerbaits with massive blades and hard bodys with wider bib – but this couldn’t be further from the truth. Cod do love the extra loud attraction but sometimes subtlety is key. 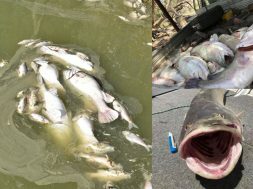 Murray Cod feed on Carp and other baitfish which make very little noise underwater, and this happens in the dirtiest of river. If they can find a carp then they can find a plastic. One way you can fish find your lures in dirty water is by using a weedless hook with a blade attachment. The Owner Flashy Swimmers are perfect for dirty water or when the fish are having trouble finding your plastics. A small blades hangs underneath the plastic and emits a subtle pulse during the retrieve. The day was coming to a close and the plastics continued to out fish all other conventional lures. I had changed to a Pearl White colour in hope of finding that ‘big’ fish which we had yet to find on the trip. I drifted in close to a small bunch of willows sitting behind a rock wall, nothing special but enough to hold a fish. I started rolling the plastic out along the top side of the willow before allowing it to sink while I corrected the boat. The falling plastic must have been enough for the powerful fish that pulled me to the opposite side of the inflatable. This fish kicked hard, producing some solid power as it directed me back into the willow branches. I tried to navigate the trees and put pressure on the fish before I was able to steer it clear towards the net. This fish was a tank and was pinned perfectly in the corner of the jaw, the weedless plastic worked! 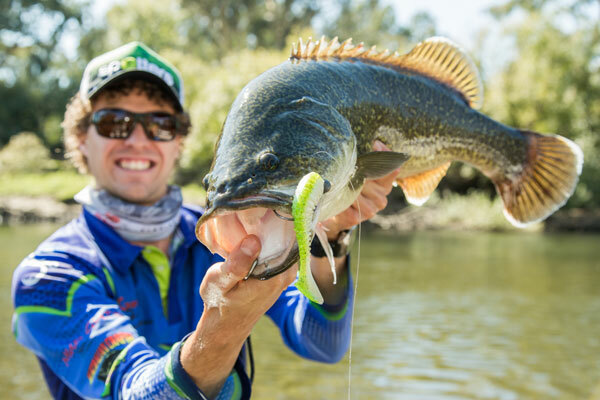 This is just one of many trips where the soft plastic surpassed the standard native lures. Rig them weedless and you’ll have the finest weapon of subtlety.